A Malvern-based software company has praised apprenticeships saying ‘university will not give you all the skills a business needs’. 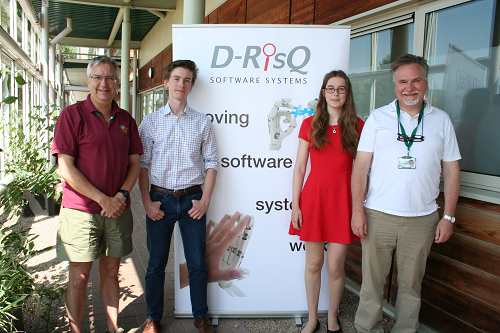 Located at Malvern Hills Science Park, D-RisQ was established in 2012 and produces software and systems verification technologies aimed at high integrity systems such as those found in aerospace. With a team of 12 people, the company have seen the benefits of apprenticeships and have taken on two apprentices in the past, with both currently in training. Hannah Saunders, 19, is studying a Level 3 Software Apprenticeship and is learning programming languages, as well as developing user interfaces for the verification tools before she finishes in January 2019. Ross Lambert, 20, will finish his three-year, Level 4 Software Apprenticeship with TDM in September this year. Ross has been offered a contract to work with D-RisQ once he satisfactorily completes his apprenticeship. During his time at the company, Ross has been developing user interface tools, linking Linux Programming to Windows Software, developing the technological architecture and linking Central Processing Units. D-RisQ received an apprenticeship grant from Malvern Hills District Council and government funding for 16 to 18-year-olds in training non-wage costs. With plans to take on a marketing trainee in the next 12 months, Professor Colin O’Halloran of D-RisQ, said: “There was a need to grow the business and it made sense to train local talent to the business culture. We look for people with enthusiasm for our industry and willingness to be adaptable and learn.